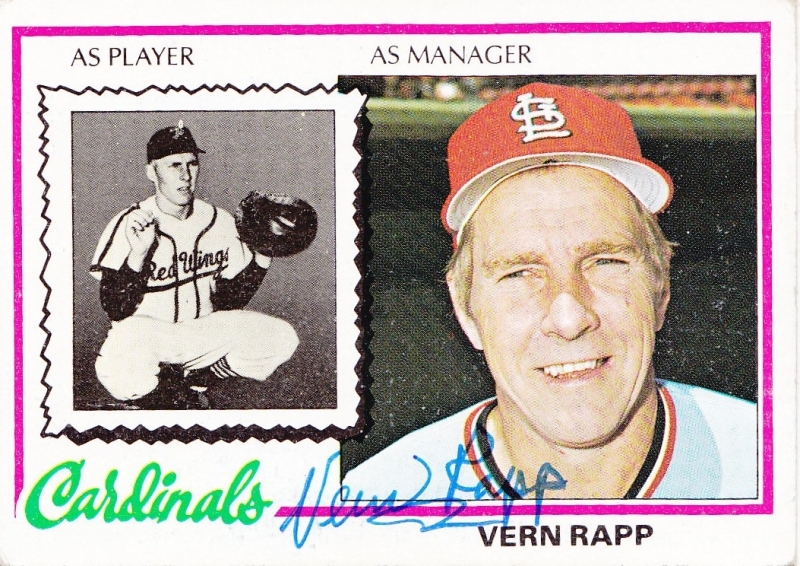 Vern Rapp, former major league manager with the St. Louis Cardinals and Cincinnati Reds, passed away Thursday December 31, 2015 in Colorado. He was 87. 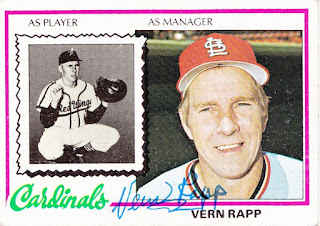 Rapp, who spent parts of two seasons at the helm of the Cardinals (1977-78) and the Reds (1984), started out as a catcher in the Cardinals minor league system in 1946. After surviving a beaning during his second season, Rapp found himself starting in the playoffs for the Cardinals AAA team in Columbus in 1948 just one step away from the big leagues. The promising start for the young catcher was derailed like many others of his era by Uncle Sam. In 1950, Rapp was drafted into the United States Army. He lost two years of his career to his military service, something that he couldn’t recover from. He played at the AAA level until 1960, but spent most of his remaining time in the minors as a player-manager starting in 1955 with Charleston. At only 27 years old, Rapp was offered the job halfway through the season to replace Danny Murtagh. He quickly asserted himself as the manager, ruffling the feathers of many of the veterans, including the 39-year-old legendary slugger Luke Easter. “We were in Minneapolis one night and Monte Irvin was with Minneapolis,” he said. “Back in those days, you didn’t talk to the other team before the game, it was always a war. Rapp managed in the minors until through the end of the 1976, even getting a base hit at the age of 48 during that season with Montreal’s Denver farm club. During our interview in 2008, he recalled how and why he put himself in the lineup that day. In 1977, he replaced the easy going Red Schoendienst as manger of the St. Louis Cardinals. Tactics that he used in the minor leagues to regulate the actions of his players didn’t fare well for him at the major league level. Enforcing strict rules about how the players dressed and forcing players like Al Hrabosky to remove his trademark mustache caused tremendous dissent among the ranks. Shortly after a public spat with catcher Ted Simmons where Rapp referred to him as a “loser,” General Manager Bing Devine fired Rapp after 17 games into his second season. Rapp quickly got back on his feet, joining the Montreal Expos as a coach from 1979-1983. Just as he was going to retire, the Cincinnati Reds hired him as their manager to start the 1984 season. One of his prized pupils was John Franco, who currently holds the major league record for saves by a left-handed pitcher. Rapp helped encourage Franco’s transition from a starter to a reliever during his rookie season. His work with Franco was one of his few highlights of his time with the Reds. After posting 50-71 record in which he used 101 different lineups, he was replaced in August by Pete Rose who was acquired from the Expos as a player-manager. It spelled the end of Rapp’s managerial career. He finished with a 140-160 record in parts of three seasons in the majors. Despite his reputation as a strict manager, Rapp felt a tremendous obligation towards the fans. Well into his retirement he continued to receive autograph requests sent to his home and he proudly fulfilled every one of them. “I was taught in the old school that you take care of the fans first,” he said. Some sixty years later, Rapp continued to look at the game through the his managerial lens. He noted how the minor league system has experienced an upheaval in almost every regard possible. The million dollar salaries that Rapp felt were affecting player development were a far cry from the peanuts he made at the lowest level of minor league baseball in 1946. The struggles he had to make a dollar stretch during those years ultimately fostered a deeper love for a game that gave back to him for almost the next 40 years. “I got $150 per month if you were lucky,” he recalled. “We used to get $1 per day in meal money. We used to go to Walgreens for $.35 for breakfast. That was about the only place you could go on the road.